I didn’t have much time, or energy, to spend on the car today. My back was bothering me something fierce after yesterday’s marathon hunched over the car fitting the knee panels and trim so focused on some minor punch list items today. Kim was around so she helped out with an extra set of hands. First up was to get the throttle cable bracket adjusted and screw it into the intake. When fitting it prior, the bottom hole was off by 1mm so inserted a round 1/8″ file and opened it a tad bit bigger. It then screwed into the bracket with no issues. I torqued until tight with a hex head wrench (Allen wrench) which should be tight enough (no torque specs). After that, I moved onto the diff to fill that with RedLine EP90 GL5 diff fluid and the gear slip lube from Caterham but don’t have a 13mm hex head to get the filler plug off. I made a quick trip to Sears but they didn’t have anything of that size in stock. I’ll have to order one online this week. 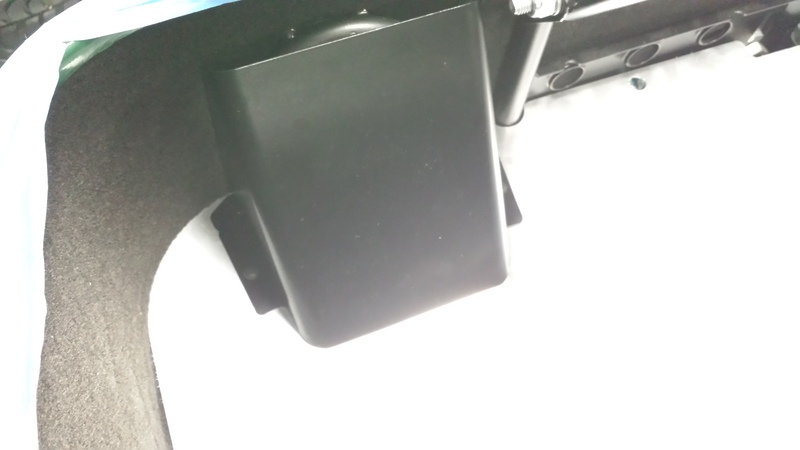 With the diff on hold, I went ahead and attached the honeycomb metal boot floor and the boot board back into the boot (trunk to Americans). Screwing things back in with the self tapping screws was straightforward, but did have an alignment problem. 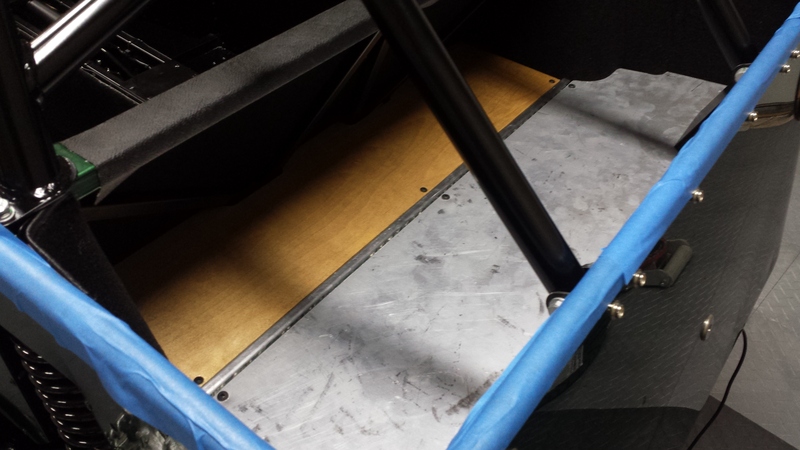 Since both the metal and wooden boards were fitted with no carpet at the factory, now that the carpet is in place the boards are slightly off from their original location. I had to get a drill bit and open them up ever so slightly to get them back into alignment (and a few smacks with the palm of my hand to force them down). You’ll also notice the vinyl starting to sag a bit on the underside of the cross-member in the pic below – that adhesive from Permetex isn’t the best. With the boards back in, I fit the fuel filler cover. Straightforward as described in the manual; drill two pilot holes in 2mm and fit self tapping screws. The angle was a little odd but everything was in without issue. After that, I fit the carpet into the boot floor. It needs to be trimmed in a couple places but fits well enough that I can worry about that later. I also noticed the carpet sagging slightly from where I had glued it in yesterday as mentioned above. Overall, I’m disappointed in the Permetex carpet adhesive – just not getting a good adhesion despite several coats being used. The loom plugs into the ECU just behind the plastic water rail junction at the back of the engine. 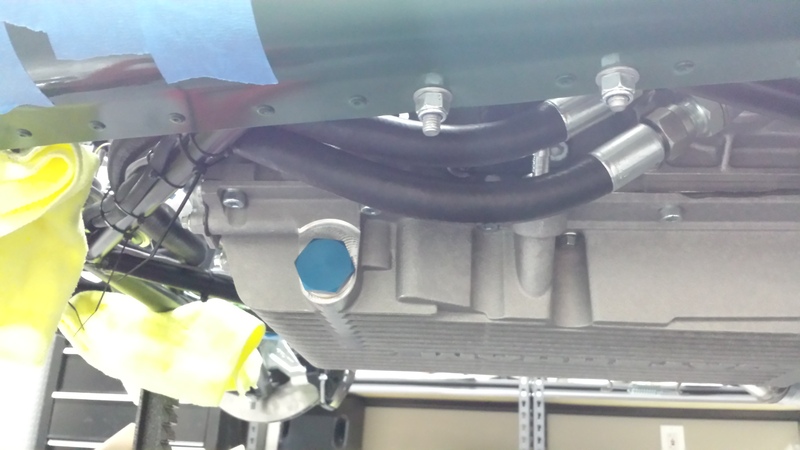 The alternator, grounds, and crankshaft sensor all route down the left side of the car using the frame as mounting points, just under the washer fluid bottle. Follow the X cruciform around the front of the engine then peel off each wire and route to the crank shaft and alternator as appropriate. 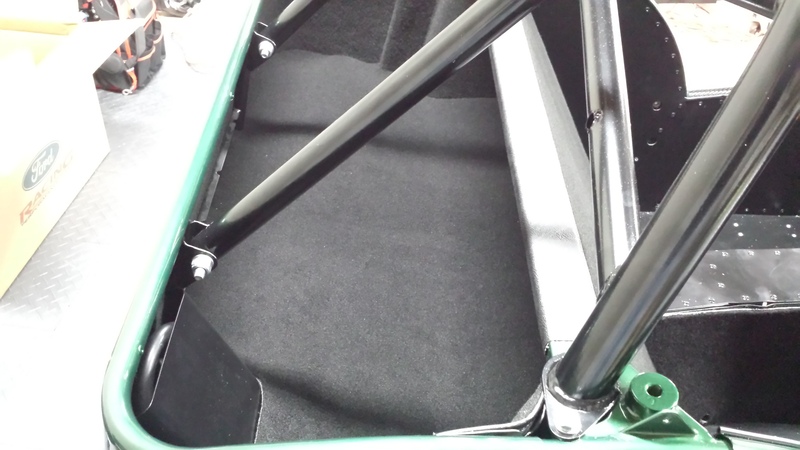 Secure the fuel injector, cam sensor, and coil wiring under the Caterham engine cover. While it seems correct to route the wires out of the hole in the cover it is not. Thanks to Simon for pointing out my wiring for the coil pack was backwards. The correct route is to go under the Caterham engine cover by the fuel rail, then make a U turn under the cover and then run front to back. Double check your wiring chart for the correct plugs and match them to the correct injector numbers; cylinder #1 is at the front of the engine. After the wiring was tidy underneath the engine, I went ahead and figured out how I wanted to run the oil cooler lines. Kim helped pass things back and forth while I was under the car. 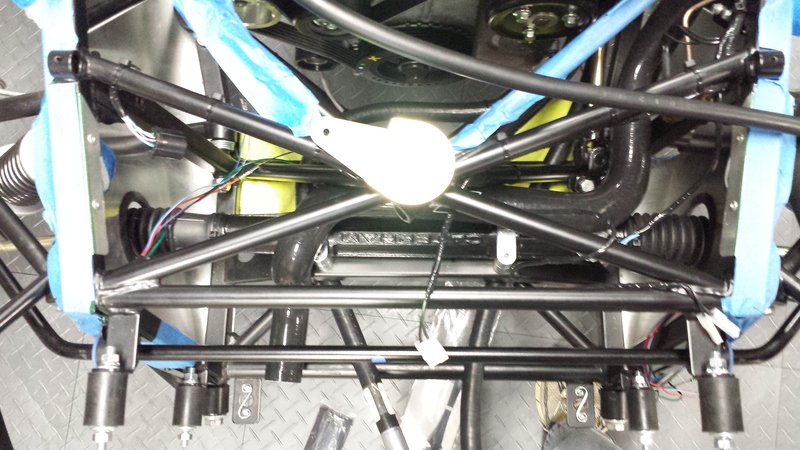 After a few different ideas, we settled on running the short hose between the steering rack chassis mount and the X cruciform on the bottom of the chassis. It then ran back towards the modine and dipped under the engine mount. The long hose ran between the steering rack chassis mount and X cruciform on the right side, then make a zig-zag between the horns and the crankshaft, then dipped down under the engine mount, and attached to the modine. Liberal use of wire ties was successful in keeping it in place as desired. Once happy with the oil lines Kim helped me torque down the steering rack and steering universal joint bolts. Steering rack was torqued to 11nm and the universal joint bolts torqued to 20nm after validating the steering U joint was aligned with the rack. 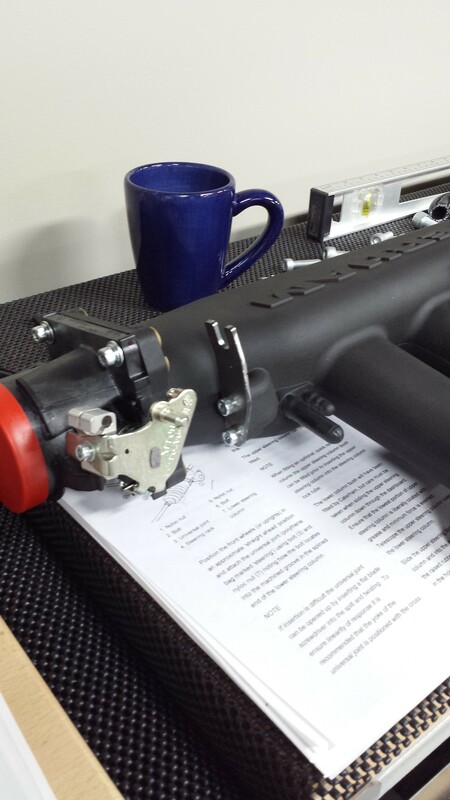 Note, its important to keep the U joint as straight as possible where it meets the steering rack. After that, we called it a day and went upstairs to watch Star Wars (her idea, really, I’d have stayed down there longer).